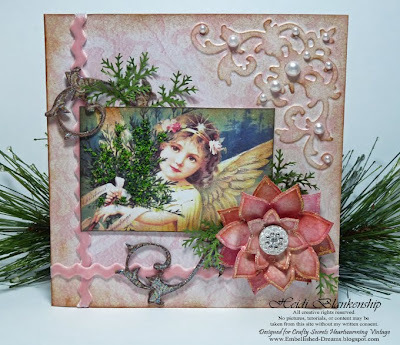 Today is the Crafty Secrets Design Team Challenge blog hop and I can't wait to see what all of the ladies have been busy creating. 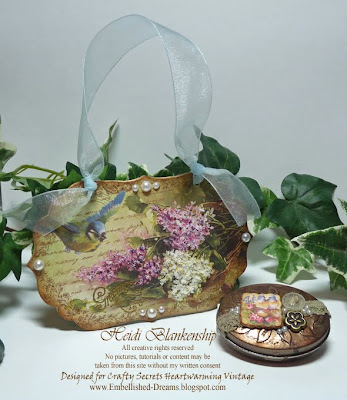 Vicki Chrisman our wonderful and very talented Design Team Coordinator gave us a challenge to create a project with a bird theme. 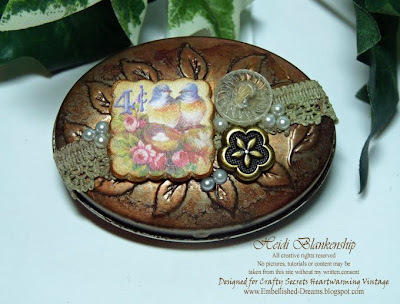 Crafty Secrets has several products with beautiful images of birds from stamp sets, journal and note booklets, vintage postcard kits, creative scraps, stickers and vintage cuts. 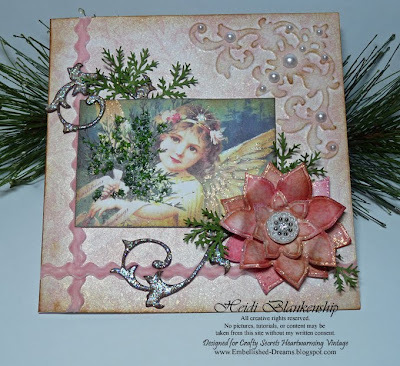 For my projects I used the Best Buds Vintage Postcard Kit and matching Stamp Set. 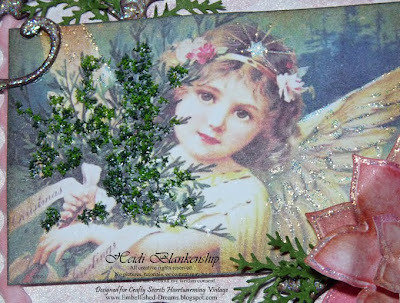 I love working with the Vintage Postcard Kits, the images are so beautiful and the creative possibilities are endless. The Vintage Postcard Kits come with 6 Large Images, 12 Image Embellishments, 18 Ivory Chipboard Pieces and a Matching Stamp Set. 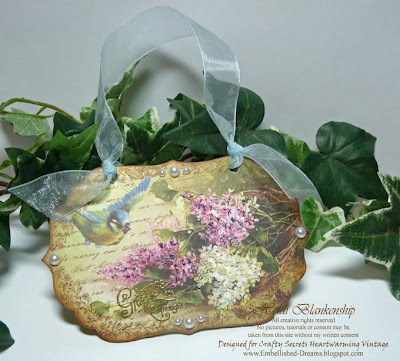 The first project I created is a little mini wall hanging with one of the large images from the Best Buds Vintage Postcard Kit and one of the large ivory chipboard pieces. 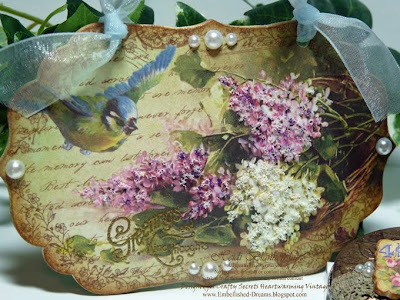 I started out by cutting out the image of the bird with the nest and lilacs and using 3-in-1 Advanced Craft Glue from Beacon to adhere the cardstock image to the chipboard piece. Then I sanded the edges for a nice smooth finish. 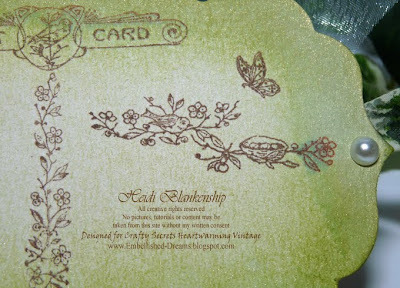 Next I inked the edges using Vintage Photo Distress Ink from Ranger and then I stamped the floral vine images with Rich Cocoa Memento Ink from Tsukineko. 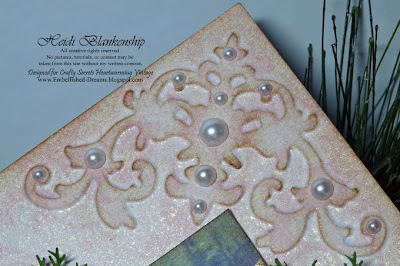 Here is a close up where you can see the stamped images around the edge of the chipboard. Then I misted the edges with Honey Dew Mist, Glimmer Mist from Tattered Angels. I let the Glimmer Mist sit for a few seconds and then took a kleenex to lightly blot it. Once the paper was dry then I stamped the sentiment with gold pigment ink and added gold embossing powder and heat set. 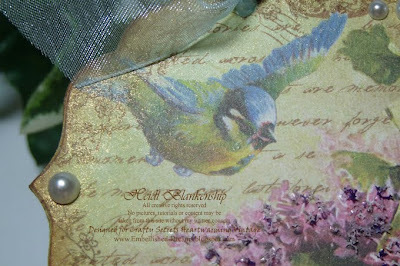 Here is a close up picture where you can see the shimmer from the Glimmer Mist on the edge of the chipboard. I also added some Lilac, Lavender and Ivory Flower Soft to the lilacs, a few pearls and finished of the wall hanging with a light blue sheer ribbon. For the backside of the postcard I used Peeled Paint Distress Ink from Ranger to ink the chipboard. Then I stamped several of the stamp images from the Best Buds matching Stamp Set. I also added Honey Dew Mist, Glimmer Mist from Tattered Angels to the edges and a few pearls. 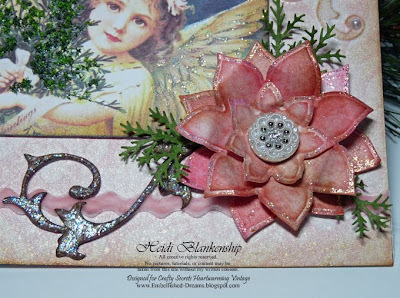 Other~Tattered Angels Glimmer Mist Honey Dew Mist, Flower Soft Lilac, Lavender, Ivory and Flower Soft Glue, Beacon-3-in-1 Advanced Craft Glue, Gold Embossing Powder, Heat Tool, Pearls, Blue Sheer Ribbon. Don't forget to check out all of the Fabulous projects made by the Crafty Secrets Design Team! Here is a list with links to their blogs. 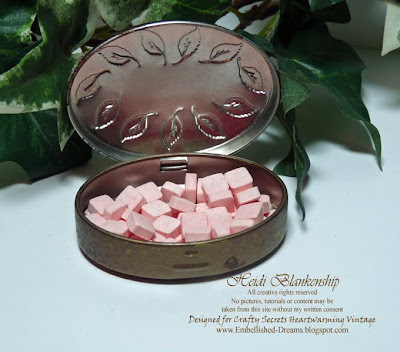 I also wanted to let you know that Marisa Grosson will be giving away a $30 Gift Certificate for Crafty Secrets on her blog and Sandy Redburn, owner of Crafty Secrets is also going to be having some fun Blog Candy on the Crafty Secrets Blog. Thank you so much for stopping by today and I hope you enjoy the Crafty Secrets Design Team Challenge! I hope you have a Wonderful Weekend and a Spooktacular Halloween!!! Hello! It seems like forever since I have done a blog post with some artwork, and I am sure you are agreeing with me. *wink* Thank you so much for your understanding!! I also want to thank you for all of the wonderful comments, well wishes and prayers for my MIL and our family. We have very deeply appreciated it. I am doing much better but still have a little bit of a cold and cough. But everyone I talk to who has been sick has said the cough lingers on for weeks. My MIL is still in the hospital, it has really been up and down. The doctors have said they have done everything they can for her and now a lot of it just depends on if her body is strong enough to pull through this. So thank you for your prayers!! My husband came back home on Monday, I know this has been very hard on him and it's hard to be so far apart. I just wanted to let you know to please be sure and stop back tomorrow as I will be doing a post with some really artwork. LOL! 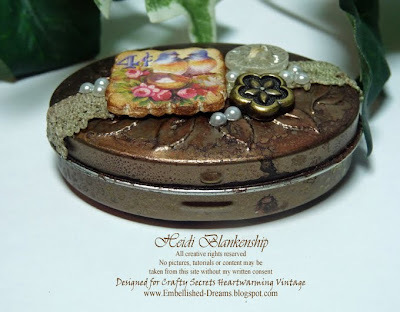 Crafty Secrets Design Team is having a Blog Hop tomorrow and I can't wait to see what all of the girls have created! Thank you again for all of your understanding, support and prayers!! I will try to post when I can, when I am feeling better and things calm down around here. Thanks for understanding!! I hope you have been enjoying World Card Making Day and have found at least a little bit of time today to be creative. Or maybe you are one of the lucky ones who has been creating all day!! This morning I was at Scrapping On The Go! teaching a card class. The class was full and all of the ladies were so wonderful and had a great time creating, sharing, talking and laughing. Thank you so much for stopping by today! 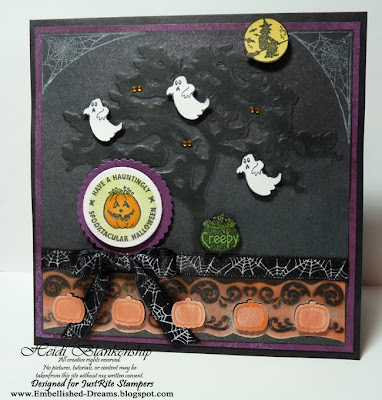 Be sure to hop on over to the Crafty Secrets Blog to find out all of the details about the Crafty Secrets Challenge over at SCS for World Card Making Day. 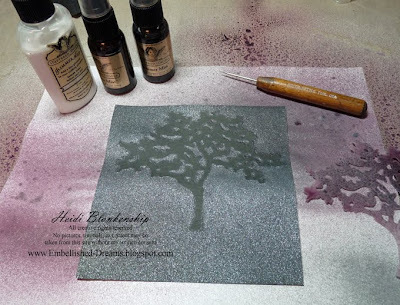 Also hop on over to the Spellbinders™ Blog, Beth has a great tutorial for making quick and easy cards. I hope you have a Wonderful Weekend!! This past July while I was at CHA in Orlando, Florida Spellbinders™ and Tattered Angels booths were right next to each other and in conversations the wonderful ladies with Tattered Angels told us about using their Glimmer Screens in the Wizard™ to create Beautiful embossed backgrounds and we were all sooooo excited!! Who doesn't love a new technique! 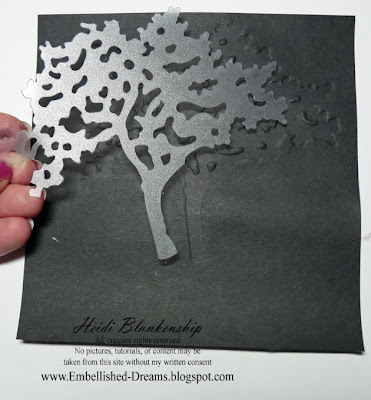 *wink* A couple of days ago I posted the card shown below and today I am going to show you how I created the tree in the background. If you would like to find out more details about this card you can click HERE to see the post. 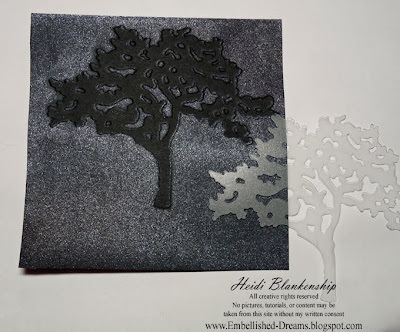 To create background you will need a Wizard™, die cutting and embossing system along with the White Master Mats (2 of them) and a Tan Embossing Mat (1) from Spellbinders™, Glimmer Screens and Glimmer Mist from Tattered Angels and something to hold the Glimmer Screen in place, like a paper piercing tool or a stylus and some kleenex. You will also want to lay down some scrap paper to cover your work area or a mat for easy clean up. **Just a Note--when you purchase the Wizard™ you will also receive 2 White Master Mats and a Tan Embossing Mat with the machine. Create a sandwich using the mats as shown in the picture below. Then run the mats through the Wizard™. Once the mats have been run through the Wizard™ this is what the backside (side that was face down on top of the Glimmer Screen) will look like. The Glimmer Screen that I used to for this project is from the Blossom set. The set includes a tree, branch and a floral flourish. 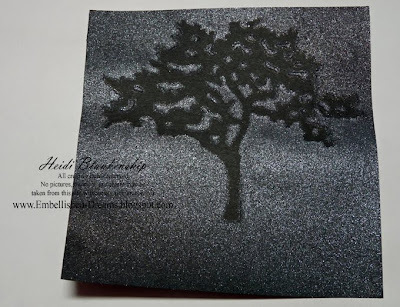 You can see from the picture the deep impression (debossed area) created in the cardstock. The Wizard™ has over 3000 lbs of pressure--Yes, I did say over 3000 lbs!! With all of that pressure is gives the Wizard™ the unique ability to leave such and amazing and detailed impression. Carefully remove the Glimmer Screen. I let the cardstock sit for a few second and then I place a kleenex on top of the cardstock and just lightly press down on the cardstock. 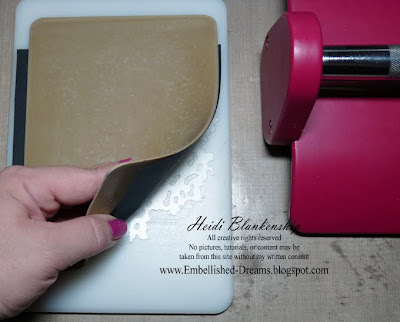 Doing this helps to create a very soft and smooth finish. 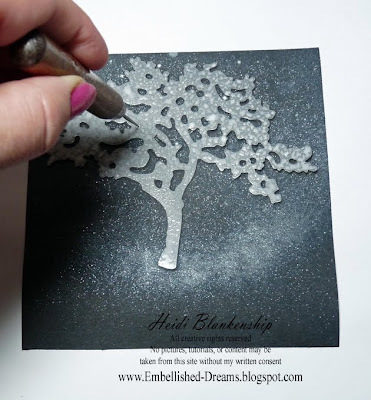 Since the fibers in the paper have become a little damp from the Glimmer Mist the embossing loses a little bit of the crispness and the paper my also be a little wavy. 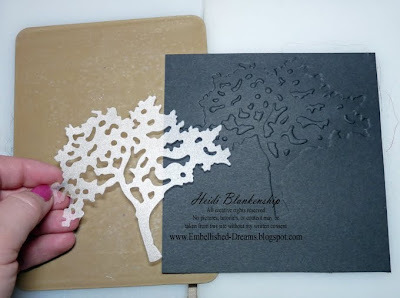 To get the crisp emboss back into the cardstock you will turn the cardstok over to the backside and line up the Glimmer Screen. Holding the Glimmer Screen in place lay it facing down onto the White Master Mat, place a finger on the top side to hold it in place and then add the Tan Embossing Mat and White Master Mat. You are basically lining up the mats the same way as in Step #1 but you will need to line up the Glimmer Screen and then run the mats through the Wizard™ again. Remember that 3000 lbs of pressure I told you about? 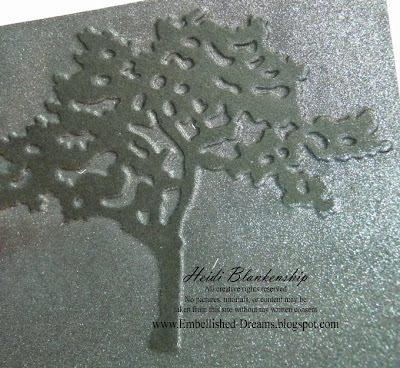 Well, it will not only leave a crisp emboss the second time through the Wizard™ but do you see how nice and smooth the other areas of the cardstock are--no more wavy paper! Thank you so much for stopping by today! I hope you enjoyed the tutorial! :) I know for myself I love trying new technique and it's always an extra bonus when I can get the most out of products and be able to use them in several different ways. Don't forget to check out the websites and blogs for both companies, I'm sure you will find many creative ideas to inspire you!! I hope you have a Wonderful Weekend!! Don't forget tomorrow is World Card Making Day--I hope you can all enjoy some creative time!